This stove will cook all your outdoor meals. Breakfast, lunch, and dinner, in any weather, on your camping, canoeing, fishing, hunting, and all other outdoor adventures. I bring this stove with me gold panning. It is lightweight and tough enough to follow me up and down the riverbeds. This is the Coleman® Guide Series® Compact Dual Fuel™ Stove. The cooking surface fits a 6-in. pan above a Band-a-Blu™ burner that delivers 10,000 BTU’s of cooking power. Dual Fuel™ Technology gives you the option of using Coleman® Liquid Fuel or unleaded gasoline. Now you can take less fuel with you to save money and packing space. Wind baffles help shield your flame from the wind so that the most heat possible goes into making your meal. This Coleman is a single burner model, easier to carry around and just as powerful. The Coleman Filter Funnel is a great companion to this stove and is included in the U.S.A. package. Cost: $72.20 US Dollars. Price may vary in your country of origin. Amazon Prime: Do not neglect to look at this important feature. It can reduce or eliminate your shipping costs. The name Coleman is synonymous with camping and the outdoors. 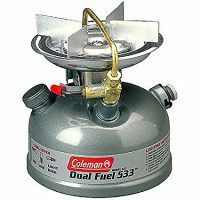 I remember my father using the Coleman 2-burner white gas stove on our fishing trips when I was still in school, many, many years ago. Continue reading below to see why this is such a great stove to bring with you on your next fishing, hunting, or camping adventure. By the early 1970’s, I was already a young, experienced camper, fisherman and outdoors enthusiast. In those early days, I had only two concerns, playing and eating, in the great outdoors. This was my first contact with the Coleman Stove. We cooked and ate countless meals on this stove. I can still fondly remember to this day, the countless number of times we used Coleman stoves to cook Lobsters on our boat, Clams on the beach, and Hotdogs and burgers when we got tired of seafood. I often wish that I had such easy access to this seafood today. One day when I was much older, I asked my father why he always brought that green Coleman Stove with us. His reply was swift and short! It’s Tough, Durable, and Reliable. These are the exact same qualities that I have seen in the Coleman products that I own and use to this very day. I do not own this exact model of stove, however, the model I own and use is quite similar. It has served me without fail for years. I have no hesitation in recommending this stove to anyone looking for a powerful, easy to light, easy to use, 1-burner stove for all your Camping, Canoeing, Kayaking, Hunting, Fishing, and other outdoor adventures. It is a bit too heavy and bulky for Backpacking, however, is an excellent stove for any outdoor situation where you do not have to carry it too far. There are much lighter stoves than this one, for backpacking, but they are perhaps not as tough! No worries about running out of fuel. You can always use the fuel from your vehicle. What a comforting thought, when you are in Nature. No need to return early from your trip, because you are low on fuel, or out of fuel completely. There are many different stoves on the market today, in this size range. However, for the cost, easy to use and durability, it beats most of them, hands down! I have used many types of stoves over the years and The Coleman Stove line are a very popular and reliable brand. If you have any comments, questions, or suggestions about this stove or other stoves, please do not hesitate to leave them in space below. I will do my best to reply to them in a timely manner. Check out my Contact Me form for more details on how to reach me with your queries about this stove. ah the good old Coleman stove! I have used this exact model multiple times during hikes in the deserted forests of Scandinavia and it is a really good product! Concerning your notion about the vulnerability? While transporting it, I always had a green plastic case around it, which fitted perfectly and was not even considered big. However, I am not fully sure whether this one was hand made, by on of my friends or if it’s also a product from Coleman, with the purpose to protect the stove? In any case, it’s a good tip to have a case around your Coleman stove for protection, and you can also keep your matches or lighter in there, so that you never have to search where you left them the day before. I am pleased to hear about your hiking adventures in Scandinavia, and how you use a Coleman Sportster II Dual Fuel Stove to cook your meals and/or boil water. I remember this green plastic on some models, long ago. My model did not include this plastic box and came in a cardboard box. I did make one out of a metal coffee can that serves me very well. Like you, I fill it with lighters, pot cleaners, utensils, and other stove and cooking paraphernalia. Do you use your stove during the winter season? What model of pot or pan do you use with it?